1968-69 B-Body Black Seat Belt Set for Bench Seats. 1968-69 B-Body Black Seat Belt Set for Bucket Seats. 1968-69 B-Body Blue Seat Belt Set for Bench Seats. 1968-69 B-Body Blue Seat Belt Set for Bucket Seats. 1968-69 B-Body Brown Seat Belt Set for Bench Seats. 1968-69 B-Body Brown Seat Belt Set for Bucket Seats. 1968-69 B-Body Green Seat Belt Set for Bench Seats. 1968-69 B-Body Green Seat Belt Set for Bucket Seats. 1968-69 B-Body Red Seat Belt Set for Bench Seats. 1968-69 B-Body Red Seat Belt Set for Bucket Seats. 1968-69 Seat Release Knob. A-, B- & C-Body. Sold as a Pair. 1970 B-Body Black Seat Belt Set for Bench Seats. 1970 B-Body Black Seat Belt Set for Bucket Seats. 1970 B-Body Blue Seat Belt Set for Bench Seats. 1970 B-Body Blue Seat Belt Set for Bucket Seats. 1970 B-Body Brown Seat Belt Set for Bench Seats. 1970 B-Body Brown Seat Belt Set for Bucket Seats. 1970 B-Body Green Seat Belt Set for Bench Seats. 1970 B-Body Green Seat Belt Set for Bucket Seats. 1970 B-Body Red Seat Belt Set for Bench Seats. 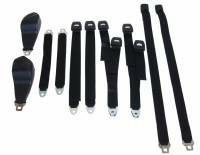 1971 E & B Body Hardtop Black Seat Belt Set.